Sentenced several years ago to die for what one attorney called “an assault on the American dream,” two of Connecticut’s most despised criminals are among the 11 Connecticut death row inmates who will no longer be executed. The Connecticut Supreme Court ruled Thursday that Connecticut’s death penalty is unconstitutional. The state passed a law in April 2012 to repeal the death penalty for all future capital offenses. But one death row inmate, Eduardo Santiago, whose attorneys have argued since the law change that any execution carried out after the 2012 repeal would constitute cruel and unusual punishment, won his appeal today. The dissenting justices clearly state how the four members of the majority have disregarded keystones of our governmental structure such as the separation of powers and the role of the judicial precedent to reach the decision they hand down today. The death penalty and its application is a highly charged topic with profound emotional impact, particularly on the victims and their loved ones. Justice Espinosa, in her dissent especially, forcefully and compassionately recognizes that devastating impact. Prominent New Haven-based criminal defense attorney Norm Pattis, a death penalty opponent, does not agree with those who want an eye for an eye. As with the attorneys for the other nine death row inmates, Pattis says the lawyers for Hayes and his accomplice, Joshua Komisarjevsky, are now filing motions to correct what is now an illegal sentence. That proceeding, Pattis says, could take 30 seconds or all day, depending on how many people would like to be heard, including Dr. Petit, whose daughters and wife were tortured before they were murdered by Hayes and Komisarjevsky. “Mr. Pettit, under the state constitution, has a right to be heard at every stage of the proceedings,” said Pattis. 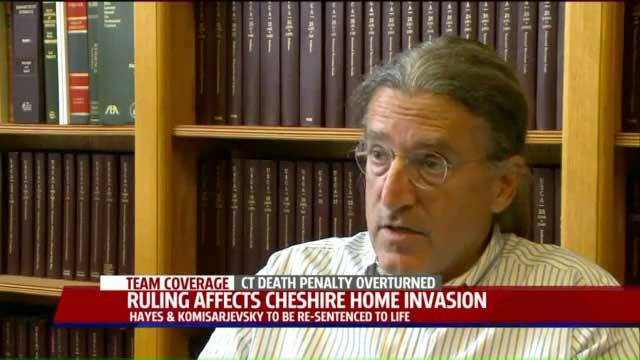 But with Connecticut now joining 16 other states in completely abolishing the death penalty, Fox CT asked Pattis if he could imagine there would ever be a day when a life sentence, without the possibility of parole, is changed? “It's exactly as it sounds today, but there is always a possibility of parole, depending on how legal doctrines evolve,” said Pattis. That being said, he believes it is unlikely the Cheshire killers will ever be set free. Then again, there was a change in juvenile life sentences. “The Supreme Court has held that 60 years, or a life sentence for a juvenile, is unlawful and so you've got a series of resentencing cases there,” added Pattis. The worldwide prominence of the Petit murders is easy to understand, said Pattis. State Senate Minority Leader Len Fasano, R-North Haven, released a statement on the ruling as well. Today Connecticut’s Supreme Court stepped way out of line and wrongfully took on the role of policymakers. Their ruling deliberately circumvented the will of the people and the legislators who represent each and every Connecticut resident. If the court rejected the death penalty repeal legislation based on an argument that it violated equal protection by creating a separate class of citizens, the remedy should rightly be to strike it down, which would leave us with the death penalty intact per prior law. Instead, the activist court chose to act as policymaker and expand the repeal beyond what was approved by state lawmakers. I agree with Justice Espinosa’s dissent. This court has overstepped its constitutional obligations and allowed personal interpretations of what some may think are just and fair to overshadow the law as defined and enacted by the people. “I, alongside Sen. John McKinney, warned that this would happen when we voted against this legislation. But warnings were ignored as Democrat leaders assured lawmakers on the fence that the legislation repealing the death penalty would be prospective only. Pattis says the death penalty achieves nothing, except tax payer debt. “On a national basis, the average appeal cost is in excess of $2 million,” says Gov. Dan Malloy. And in Connecticut, prisoners have a unique opportunity to challenge the performance of their counsel indefinitely, meaning endless appeals and never-ending costs for the prosecution. And crafty attorneys, like Pattis, take full advantage of Connecticut laws.